Is the Sony Alpha NEX-7 a Better Value than a dSLR Camera? New 24mp NEX-7 bears a strong resemblance to other cameras in the NEX line, but it is larger in all three dimensions. I admit it, I am intrigued by the new Sony Alpha NEX-7. I liked the original NEX cameras, but I knew that if I tried to shoot with one of them, I would miss my dSLR. There were too many limitations. First off, there was no eye-level viewfinder. I know many point and shoot cameras have jettisoned the viewfinder, forcing users to use the rear LCD as the viewfinder. Many people prefer to shoot off the LCD, even when the camera has a eye-level finder. I think the LCD is fine for studio work, when the camera is on a tripod. Otherwise, I think composing on the rear LCD is a terrible way to hand-hold a camera. Secondly, the early NEX models offer no way to use off-camera flash. Both the NEX-3 and NEX-5 came with a small, detachable flash unit, but AFAIK, the only way to use the flash was to secure it to the top of the camera. Having preached for years that a position directly over the lens is the worst place to mount a flash unit, I am not about to change my tune now. I had hopes that Sony or a third-party manufacturer would offer some solution to mounting a higher-power flash off camera, but I have yet to see such an item. 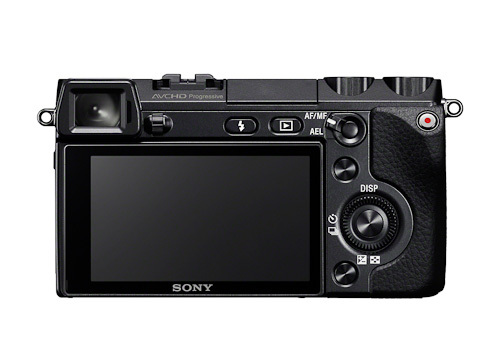 Finally, many of the controls of the NEX-3 and NEX-5 can only be accessed from onscreen menus. All current digital cameras suffer from this fault to some degree, but the NEX series is a worse offender than most in this regard. So why I liked the form factor of the NEX mirrorless cameras, I knew I would not be satisfied shooting with one for any serious work. I would always find myself regretting I didn’t have a dSLR instead of the mirrorless camera. With the introduction of the new NEX-7, all of that is changed. It’s like Sony read my mind. A much more likely scenario is that many other photographers had the same concerns I did, and Sony acted to address them. First off, there is a proper eye-level viewfinder. 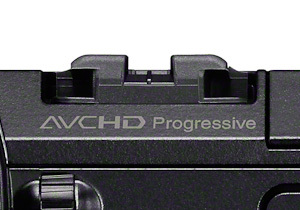 It is an EVF (Electronic Viewfinder) instead of an optical viewfinder, but that doesn’t bother me. I think optical viewfinders are superior to EVFs, but the gap is getting pretty narrow. I used to shoot with the Minolta Dimage 5 and then the Dimage 7i. These were Minolta’s early, non-interchagable lens digital cameras which incorporated a great G series lens. Both cameras had an EVF, as well as a small rear LCD. The EVF was fine for most still work. Panning action shots, however caused the EVF to smear when you swung the lens around quickly. This did not affect the actual image, of course, but it was still a distraction when shooting fast-moving subjects. I have yet to shoot with the NEX-7, but the industry has had more than decade to improve EVF performance. I recently had the opportunity to try out an Olympus Pen Micro 4/3 camera that had an optional EVF. I tried, but I couldn’t get the finder to smear. If the EVF in the Sony NEX-7 is at least as good as the Olympus accessory finder, I will be more than satisfied. Since the new viewfinder is the same XGA OLED TruFinder™ used in the new A77 and A65, I have to assume it will be excellent. 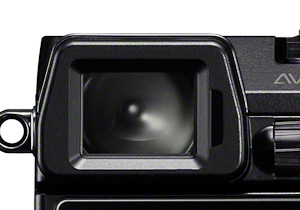 As for the flash, Sony has incorporated the standard Alpha flash shoe on the NEX-7. This is a no-brainer, as the shoe accepts the full line of Sony Alpha flash units, as well as the digital Minolta flashes. More importantly, you can finally use off-camera flash, by attaching the FA-CC1AM Off Camera Cable to the Hot Shoe. While Sony still doesn’t offer a radio control flash trigger, the NEX-7 can be rigged to fire remote flash units with an aftermarket radio trigger. Interestingly, however, I see nothing in the press release to indicate the NEX-7 can trigger a remote flash with the Sony/Minolta wireless flash system. That is a shame, but it is not a deal-breaker. Finally, there are the controls. While there is still an extensive menu-driven set of controls, the NEX-7 lets users customize two knobs and a control wheel. I’m not sure exactly how the custom feature works, but I believe you can map each of the controls to operate in the way you prefer. Thus you can have manual control of the settings that are most important to you, as an individual photographer. Color me impressed. As you would expect, the new NEX-7 matches the video specs of the A77, offering full AVCHD HD progressive video. Like the A77, you can shoot at 60p or 24p frame rates. If you are used to the picture effects offered with the NEX-C3, you will be happy to know that Sony has retained the special effects on the NEX-7. There are 11 modes and 15 effects, including HDR, soft focus and Rich-Tone Mone. I am especially happy to see that the new camera includes the Sweep Panorama 3D feature. Sorry if it seems I am gushing over the NEX-7. It seems to be a great camera, but all cameras are a compromise, and the NEX-7 won’t please everyone. It is larger and heavier than the diminutive NEX-3 and NEX-5. It is still smaller than a typical dSLR, but you will need a larger pocket if you want to carry the NEX-7 in your shirt. The NEX-5 measures 4-3/8 × 2-3/8 × 1-9/16″, while the NEX-7 is bulked up to 4-3/4 × 2-3/4 × 1-11/16″. That is still a small package for a 24mp, APS digital camera, but it is 3/8″ wider, 3/8″ taller and 1/8″ thicker then the original model. The NEX-5 weighs in at 7.4 oz sans batttery and media, while the NEX 7 tops the scales at 10.3 oz. So can the Sony Alpha NEX-7 hold its own against the A77? If you a wondering whether you should buy an NEX-7 instead of an A77 or A65, here are some considerations. Image quality should be more or less equal, but the E-mount NEX cameras use different lenses than the A-mount cameras. I’m not saying that E-mount lenses are inferior, but you cannot compare apples to apples unless you are using the same lenses. If you already have a large selection of A-mount lenses, then the A77 or A65 would probably be a better choice. There is also lens lineup to consider. There is a full range of A-mount lenses available, while the relatively new E-mount lineup is still missing some key lenses. Of course you can use adapters to add many different lenses, including A-mount lens to the NEX-7. The NEX-7 lacks in-body stabilization however, so none of your A-mount optics will be stabilized. I was surprised to see tha the NEX-7 has 25 focus points, while the A77 has only 19. So advantage NEX-7, if you like controlling focus points. The A77 can shoot 12fps, while the NEX-7 is limited to 10ffps. Both cameras can shoot at an upper ISO of 16000, but the A77 can offer lower noise by shooting at ISO 50, while the ISO range of the NEX-7 starts at 100. The A77 features built-in GPS, but there is no indication of on-board GPS with the NEX-7. The A77 is also built better, with dust and moisture sealng. So which is the better choice? Does the smaller size of the NEX-7 offset the advantages of the A77? One important final point: the NEX-7 is priced less than the A77, but it will still set you back more than a grand. The body only price is $1199, while a kit that includes the 18-55mm F3.5-5.6 E-mount lens retails for $1349.99. That is not a big price differential, and it is quite a bit more than the list price of the A65. It is roughly double the price tag of the smaller NEX-5. That is a lot to null over, but f you are ready to take the plunge, both flavors of the NEX-7 can be preordered at Sony Style. Amazon is also taking preorders for the NEX-7 body only package. B&H Photo is also taking orders on both the NEX-7 body and the NEX-7K package with the 18mm lens. This entry was posted in NEX-7 and tagged Alphatracks, digital camera, Evil Camera, Mirrorless Camera, NEX-7, Photography, Sony Alpha, Tom Bonner. Bookmark the permalink. Post a comment or leave a trackback: Trackback URL. While the Sony NEX-7 is intriguing I don’t see it replacing a DSLR. It would be a nice supplement, but it still doesn’t have the versatility of a DSLR (particularly in a choice of lenses) . It is also too big to replace the compact point and shoot camera. The body is OK but add a zoom lens and it isn’t going to fit in your pocket or be discreet. 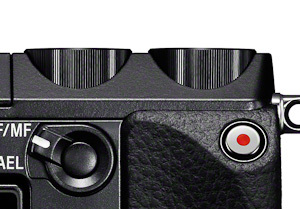 I think the A77’s and NEX 7’s sensors are identical.. therefore I don’t think it can do anything that the other can’t. My K/M z10 still serves as my back-up digital unit. (Or the primary since it is so much quieter than a flip-flopper.) I’ve put in my time behind EVF cameras, and the only real disadvantage is the inability to provide the detail necessary for critical focusing. No LED panel is a match for a laser-cut prism, however, and none will ever be. I don’t think that’s much of a disadvantage, though, because most people aren’t lucky enough to have my eyesight, so the typical approximate-ness of auto-focus goes unnoticed. Sony is quickly killing off the A-mount with its SLT cameras. (In Amazon’s sales figures, Sony doesn’t have a single model in the top 40!) They are now widely despised and they are under-valued on trade-ins–not good for models that are only a year old. Vendors’ shelves and classifieds are saturated with SLT models, and in some cases they’re being priced about the same as a used Alpha 100. The Nex platform is the way to go for Sony. Since they ran their SLR business into the dirt, what they really need to do is spin off their pro and “pro-sumer” line into another company with a different name. The Sony brand name is tainted. (Nex Digital?) Nikon overcharges but they cater to photo-snobs; Canon treats its dealers like gold so they sell, sell and sell. Sony has a minute enthusiast culture because it cold-shoulders its clientele with a sterile corporate attitude. 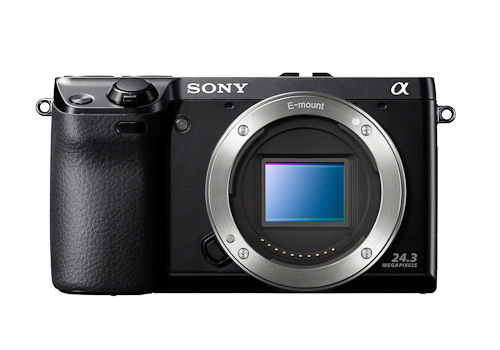 The Nex has three spots in the top ten for compact camera sales, one of which is first place. Don’t mess this up, Sony!